Recently I tried to play the game GODFATHER on my desktop.But it always gives error Pixel Shader not supported and Graphic Card not compatible. So I looked around Mr.Google for the error and he told me about 3D Analyze. 3d analyze is a Graphics Card Emulator(a nice little Software) that can emulate all the feature of a 3d graphics card like pixel shader 1.1, 1.4, 2.0, bump maps and a lots of stuff. If a game stops running on your system just because u don’t have a graphics card, don’t worry 3d analyze will do it for you.So it is very useful for running games whose requirements are greater than your computer specifications. It uses power of central processing unit to do emulation. 3D analyzer can emulate options like emulate TnL caps,Enable Pixel shader 1.4,etc.It also allows you to emulate you graphic card.You can choose NVidia or ATI Radeon according to your game requirements. Download latest 3D analyzer 2.36 . Click Here. Now click on “SELECT” button, search and open the main executable of the game you want to play. If you don’t know file path just do a right click on game shortcut icon (it’s usually on desktop or in Programs folder of “Start” menu) and select “Properties”, then “Search destination”. 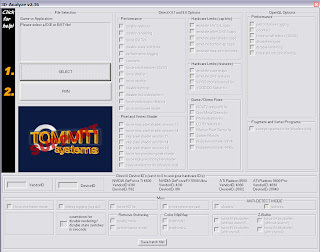 Emulating lacking hardware feature with 3D-Analyze:If your video card hardware features don’t match DirectX based favourite game’s minimal system requirements – you can look for those reading on game box and/or game readme.txt file – try to emulate those “moving” your graphics board into minimal category necessary to play it. Following are main 3D-Analyze settings to check if you want emulate a DirectX version starting from previous one. The text box VendorID and DeviceID are useful if the game won’t work again and it will show error message unsupported video card.It emulate the video card with NVidia or ATI Rademon. Filling these fields with values written in group box labeled DirectX Device ID’s, it will make your game to use your video card like a different one.So if you want to your graphic card to be of Nvidia than change DeviceID from 0 to 1. Now GODFATHER runs Like a Smoothie.. WOOHOOO!!! Also Read : 6 Easy Ways to Optimize/Boost your PC & Gaming Performance.